Bookburners: “Hell Gate Bridge” by Brian Francis Slattery. Season four, episode 5. So much happened in this episode. Like, way more than I expected! I was all like, “Oh yes, this is where the episode will end and this plot thread will be picked up next episode.” And then more happened! So this episode was pretty exciting. Before I get into the nitty-gritty of what’s up with “Hell Gate Bridge,” I should mention that this review will contain spoilers for previous episodes of Bookburners, a serial urban fantasy story. 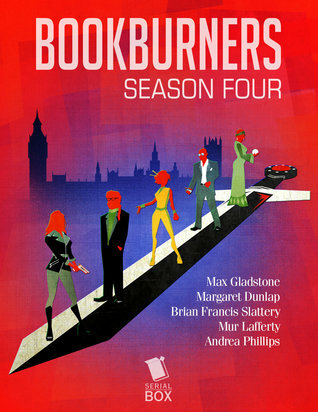 If you’re not caught up on Bookburners, you can find my review of previous episodes here. In “Hell Gate Bridge,” Menchú and Sal are off to Sal’s old stomping ground: New York City. The City’s in the process of developing a new department to handle magical crimes and one of Sal’s old cop buddies gave her a call about a body they aren’t sure how to handle. It’s melting. Literally turning more wax-like every day. And then there are the bigger questions: who murdered him and why? A little investigating suggests that someone is offing all the magical power players, suggesting that there’s a new arch-villain for this season. As Menchú says, the ship might be sinking, but some people will still fight over who gets to be in first class. Obviously, there’s some big plot stuff happening in this episode. Last week, I asked what the major story-line was going to be now that Alexander Norse was dead. This week gives us an answer. However, there’s other elements at play in “Hell Gate Bridge.” Let’s start with characters. Earlier in this season, Menchú made the decision to step back and hand leadership over to Sal. In “Hell Gate Bridge” you get to see that dynamic play out, with Menchú still acting as something of a mentor but letting Sal take the lead. You also seem him realize that he’s getting older; fighting magic is often a dangerous and physically demanding task. Is he still up to it? And then there’s the world building. If you’re a regular reader, you’ll know how much I love world building. Everyone’s adjusting to magic becoming so much more widespread and revealed to the world. New York City starting a task force just to deal with magic? I expect we’ll see more of this as the story continues.